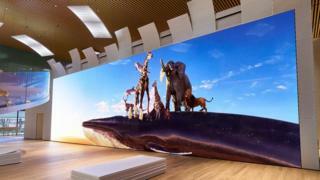 Image caption Sony describes the giant 16K display as acting like a "window to the world"
Sony's display has four times as many horizontal pixels as a 4K television and eight times that of a regular 1080p high definition TV, meaning it can show images in far more detail than normal. This will let viewers stand close to the unit - which is longer than a bus - without its image looking blurred. "We're moving slowly towards 8K TVs at the end of the decade and who knows how long it will take to get beyond that, so 16K is likely to be limited to the corporate world for the time being," commented David Mercer from the consultancy Strategy Analytics. Sony had previously designed a separate 16K display that went on show at Tokyo's Haneda Airport in 2014, but that looked like it was made up of dozens of smaller screens rather than presenting a single seamless picture. The new "super-size" installation has in fact been created out of several modular panels, but because they do not have bezels they can be fitted together without any visible gaps to create the impression of being a single screen. Sony calls the technology "Crystal LED", which is its brand name for micro-LED display tech. Samsung is also experimenting with the format. It has not disclosed the method involved, but has previously achieved what is known as "quad ultra-high definition" footage by using a method called demosaicing.